2018 was a transformational year for video streaming and the media industry in general with the biggest companies making huge investments in both content and technology. A key driver was live sports where players like Amazon, Google, and Facebook conducted some big “experiments” but where other services like Hulu, DAZN, ESPN+ and FuboTV also made big strides. Solving these issues (picture quality, rebuffering, latency) continues to be the holy grail for every streaming service (and all of their vendors). Bitmovin’s latest streaming survey reconfirms that the industry still has a big gap to bridge as low latency and CDN issues were the two of the biggest problems of 2018. CMAF and LHLS (low latency HLS) Although there are more protocols to deliver content than ever before, and quite a few new low latency protocols, we believe that HTTP based streaming will continue to dominate and that CMAF and LHLS will be adopted by many live streaming companies. While some companies have adopted WebSocket based streaming (WOWZ protocol, Nanocosmos), WebRTC (Red5, Phenix) and even RTMP, we believe that CMAF and LHLS are superior for most use cases, mainly because they are more standard and robust. HTTP works everywhere, can be cached very efficiently and can be optimized to achieve 3 to 5 seconds end to end latency. CMAF and LHLS also provide very good device support with backward compatibility for devices that can only play non-chunked, plain video segments such as SmartTVs. CMAF and LHLS also play nicely with things like captioning and ad-insertion which are a must-have for most content providers. TCP is still the underlying protocol for most video traffic on the Internet, but Akamai has joined Google and now pushes a lot of video traffic over QUIC. Different variants of QUIC exist in the industry (such as Google’s gQuic and the IETF’s Quic) but now that HTTP3 has been announced to work on top of QUIC, we should see consolidation and standardization that will eventually benefit the whole industry. HTTP3 will not be deployed in 2019, but we believe its preference for UDP over TCP will drive more video companies and vendors to invest in UDP based technologies. Moving to UDP will increase throughput and efficiency (by avoiding problems like https://en.wikipedia.org/wiki/Head-of-line_blocking), ultimately improving quality of experience for end users. As OTT services proliferate, redundancy and stability are a must and 99.99% is no longer good enough. Users cancel their subscriptions because of the 0.01% - they no longer tolerate any streaming failures. Many companies have already adjusted their architectures to accommodate multiple vendors so they are more resilient against CDN and/or cloud issues. Companies will continue to build redundant end-to-end stacks with no single point of failure. Multi-CDN was a mega trend in 2018 for the big streaming operators. We expect this trend to extend down to mid-sized companies and that Multi-CDN technologies will be more accessible and flexible. Smart operators will go Multi-CDN because it also achieves better performance which eventually translates to less rebuffering, reduced load times and better picture quality. P2P delivery makes the CDN portfolio even more diverse and powerful, and at Peer5 we are able to improve performance even beyond what any server-based Multi-CDN can achieve. Unfortunately, codec wars are still going to be a part of our lives. Many companies are going to adopt HEVC, AV1 and even both in some cases. It’s exhausting but in this competitive landscape it will probably be necessary. We expect companies to be smarter and more experienced with codec migrations. There are now solutions that allow one to change the video workflow, migrate and test the ROI of a new codec more quickly using data. #5 Data: "If you can't measure it, you can't improve it." All of the above can and should be measured by real data. Data is key to understanding how video systems work, where the problems are and where to invest in your video stack (codec, origin, player, CDN, etc). 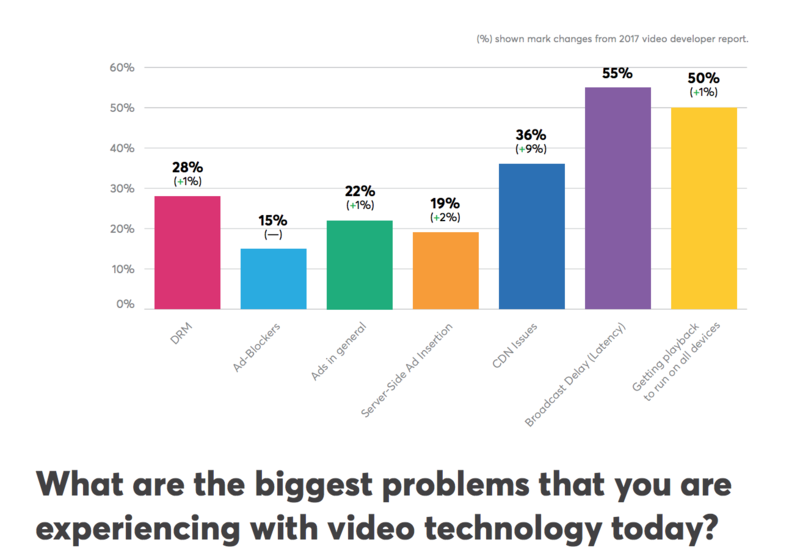 Surprisingly, in 2018, video was still more of an art than a science for many companies. Operators still react to end-user complaints rather than setting alerts and monitors and solving problems proactively. Decisions and prioritizations are not always backed up by data and user experience is not always top of mind. Budgets are being spent on products based on theoretical sales pitches and not necessarily based on data. And when we say data, we mean data that companies capture themselves during their own product evaluations and not data that is supplied by the vendor. Data is crucial. To compete and succeed, companies will have to know precisely where their problems are because if you don’t know that, how will you fix anything? Let us know if you need help to pinpoint the problems. In summary, the state of the art video stack for 2019 will be HEVC/AV1 packaged with CMAF/LHLS delivered over UDP by multiple CDNs with a P2P overlay. We predict that the competitive OTT landscape will drive video teams to implement these technologies quicker than ever before.